Ghanerao Castle is a marble and red sandstone royal castle which is beautiful, magnificent and displays the lavish lifestyle of the erstwhile royalty. Located at 140 km from Udaipur city, Ghanerao Castle is in small town of Ghanerao. Gopal Das Rathore, a valorous Rajput soldier of Mewar built this castle in 1606. Royal castle of Ghanerao has marvelous Rajput architecture. Its walls engraved with many miniature paintings. School of Ghanerao Paintings is still functioning in the village which employs mainly local artisans. Carved lattice workand huge candeliers enhance its beauty. Visitors can also see the cannon ball stike marks on boundary walls of the castle which tells the unfavorable times of the former era.Ghanerao castle has an attractive pavillion in the central court where in the musicians would perform. Cenotaphs of former rulers also a maot attraction nearby castle. Ghanerao is the only village in Rajasthan which boasts of 33 Baoris. 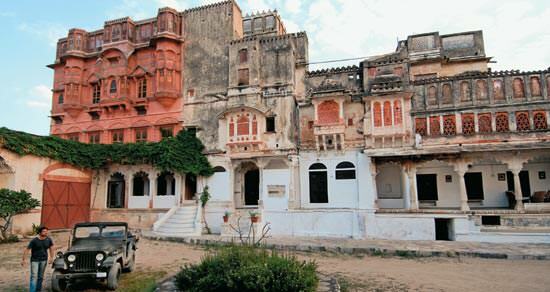 Now converted to a heritage hotel, this castle provides a true Rajasthani touch to its visitors. By Road: Ghanerao Castle is located at a distance of 140 km from Udaipur city near Kumbhalgarh National Park. One can easily reach here taxi, bus or cab. By Rail: Ghanerao Castle, Pali is well connected through nearest Rajsamand Railway station to major cities railway stations like Delhi, Agra, Mumbai, Chennai, Bikaner, Jodhpur, Jaipur, Ahmedabad. By Air: Ghanerao Castle can be reach through nearest Udaipur Airport which is well connected with regular domestic flights to Delhi, Kolkata, Mumbai, Ahmedabad, Jodhpur and Jaipur.